St. Patrick’s Day isn’t a holiday I decorate for, but occasionally we’ll do a little something fun for our family. 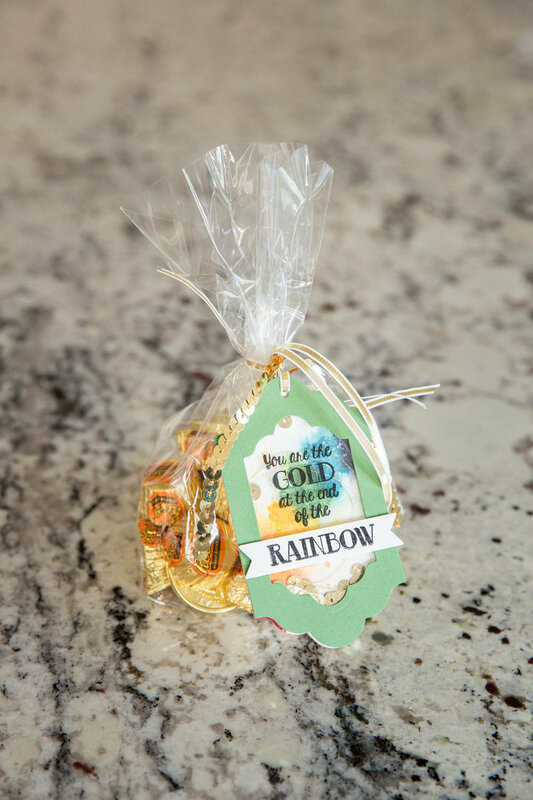 The gold coins are a novelty for the younger kids, and the peanut butter cups taste much better for the older ones, but what I love is the rainbow of color stamped on watercolor paper, using images from the Over the Rainbow stamp set. It’s like magic when you spritz with water and watch the colors blend together…super easy! And it makes a great background for the sentiment and for all the gold elements of this shaker tag! Cooper and I made a simpler version of this tag for friends, which turned out really cute too. (I had extra chocolates and didn’t want them sitting around tempting me!) We decided to use the sentiment (from the same set) God gives us rainbows to remind us of hope. I love the simplicity of this saying…and the gift from God!